A prized Japanese watermelon fetched nearly $4,000 on Monday at an auction in Sapporo. Yes, $4,000. But before you choke on your own slice of citrullus, that four-figure price tag is actually a steep fall from the fruit’s peak season several years ago, in what may be a sign that the country’s highly regarded luxury fruit market is the latest victim of tightening consumer purse strings. 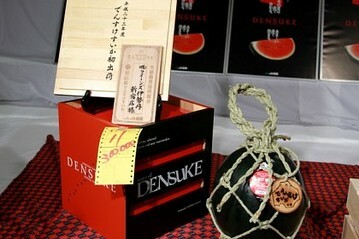 The rare Densuke watermelon, a solidly black, smooth-as-a-bowling-ball gourd, sold on the first day of seasonal bidding for 300,000 yen, which translates into about $3,740, according to the Sapporo Central Wholesale Market. While the seeds aren’t gold, the fruit is lauded for its crispy texture and extra sweet juice. And grown exclusively in Hokkaido, there are only about 100 of the stripeless watermelons available on the first day it goes on sale each year…. The highest-ever paid price for the fruit was 650,000 yen, or about $8,100, at the Maruka Asahikawa Wholesale Market in 2007. I’ll stick with the green melons, even if I have to deal with the seeds.